Can Iran’s democracy clock outpace its nuclear clock? WASHINGTON ““ Iran watchers keep two clocks: One counts down to a nuclear Iran, the other counts down to a democratic Iran. 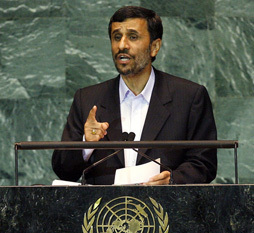 News AnalysisThe international community hopes to thwart Iran’s acquisition of a nuclear weapon. And despite the upheaval in Iran last summer, no one is sure that the autocratic regime in Tehran is on its way out – or whether it will be replaced by a true democracy. Still, recent developments on the ground – the rise last June and subsequent repression of Iran’s democracy movement, and Tehran’s apparent nuclear gains – have altered assessments about the two countdowns and whether they are influencing each other. Some hard-liners such as John Bolton, the Bush administration’s pugnacious U.N. ambassador, say getting tougher on Iran would empower its democracy movement. Others, like Shoshana Bryen, the senior director for security policy at the Jewish Institute for National Security Affairs, counter that the democracy movement has essentially been snuffed out – providing another reason for the West to get tougher. Bryen says the nuclear clock is ticking faster – earlier this month, Iran announced plans to build 10 new nuclear fuel plants – and the regime in Tehran has figured out how to gum up the democracy clock. “I think we are now not able to wait for the overthrow,” Bryen said, arguing that mass imprisonments and executions have intimidated Iran’s opposition. Israeli Defense Minister Ehud Barak delivered the same message last week in meetings with top U.S. officials, including Secretary of Defense Robert Gates and Dennis Ross, the top White House official handling Iran. A similar split is taking hold among those who oppose harsh sanctions. Many in this camp, spearheaded by the National Iranian American Council, say that the successes of the Iranian opposition movement bolster the argument for holding back on tough measures. Others, however, heeding “realists” such as former George W. Bush administration officials Flynt Leverett and Hillary Mann Leverett, say sanctions are futile precisely because the Iranian government is here to stay, so it’s better to talk to the current regime. The Obama administration appears to be shifting toward a dual track of investment in the democracy movement and tougher sanctions. Secretary of State Hillary Rodham Clinton is accelerating talks with major powers toward a new sanctions package and said last month that Iran’s government is assuming the trappings of a junta. A report last month by the United Nations nuclear watchdog, the International Atomic Energy Agency, for the first time cited as “credible” reports from Western intelligence agencies that say Iran is actively working toward a bomb. The report is helping the United States make the case for sanctions to holdouts in the U.N. Security Council. P.J. Crowley, the spokesman for the U.S. State Department, said Feb. 22 that the Obama administration is still focused on outreach – specifically an offer to get Iran to give up its low-enriched uranium in exchange for uranium enriched to medical research levels. He said an international, multilateral sanctions regime was close – underscoring the Obama administration’s focus on pressing for U.N. sanctions targeting the regime’s leadership and the Iranian Revolutionary Guard Corps that protect it. Crowley also would not count out unilateral congressional sanctions targeting Iran’s energy sector – the approach being pushed by many pro-Israel groups. Ori Nir, a spokesman for Americans for Peace Now – the only major pro-Israel group opposing the congressional sanctions described as “crippling” by their sponsors – says Iran needs active diplomatic engagement precisely because of the nuclear threat and the futility of sanctions, which he warned could backfire. Nir says the prospect that the regime in Tehran would give way to democracy is too ephemeral right now to count on as policy. A group of foreign policy realists for months has been advising the administration that investment in the Iranian opposition movement is futile. In an opinion piece in The New York Times, Flynt Leverett and Hillary Mann Leverett derided Obama’s outreach to Iran as half-hearted and said engagement with the real power – the Iranian regime – made better sense than staking anything on the democracy movement. Not everyone is ready to count out the democracy movement. David Cvach, until recently the second counselor at the French Embassy in Iran and now the Middle East specialist at the French Embassy in Washington, says he believes the fissures in Iran reach deep into the power structure. “The system has lost its amazing capacity to bring everyone together,” he said of the regime in a Feb. 5 talk at the Washington Institute for Near East Policy. Cvach says the successes of the opposition coupled with the Obama administration’s attempts at outreach to Iran lay the groundwork for sanctions that would target the regime’s elites. Trita Parsi, who heads the National Iranian American Council, says that sanctions could be counterproductive unless they are narrowly targeted. Meir Javendanfar, a respected Iranian-born Israeli analyst who believes the post-June unrest has wounded the Iranian regime, favors the sanctions targeting the Guard’s banking and business interests – for now. Broader sanctions, he says, are risky, but the prospect of a nuclear theocracy is riskier.